416 Rigby Improved built on a Dakota 76 action. These are 6 shots - 3 with the Barnes monolithic solid and 3 with the Trophy Bonded Bear Claws, both 400 grains. The load was 105 grains of H4350 in Norma brass and the Federal 215 primers. Velocity was 2470 fps for the Barnes and 2496 for the Bear Claws. Total group size 0.777". I was developing loads for this rifle, using a 1.5-5X Leupold scope. I fired the 3 shots with the Bear Claws, and looked through the spotting scope. When I saw the three shots clustered together, I though of shooting 3 solids with the same load. 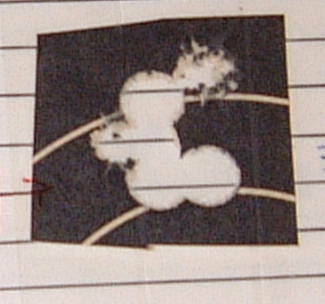 Three shots with the Barnes monolithic solids were fired at the same target, and this was the result. I stopped my load development right there. I loaded a few rounds for this rifle and took it to Zimbabwe. I shot 2 lions, 1 elephant and 8 buffaloes with it.